The gravitational constant G is a key quantity in Newton's law of universal gravitation. The gravitational constant (also known as the "universal gravitational constant", the "Newtonian constant of gravitation", or the "Cavendish gravitational constant"),[a] denoted by the letter G, is an empirical physical constant involved in the calculation of gravitational effects in Sir Isaac Newton's law of universal gravitation and in Albert Einstein's general theory of relativity. In Newton's law, it is the proportionality constant connecting the gravitational force between two bodies with the product of their masses and the inverse square of their distance. In the Einstein field equations, it quantifies the relation between the geometry of spacetime and the energy–momentum tensor. The measured value of the constant is known with some certainty to four significant digits. In SI units its value is approximately 6989667400000000000♠6.674×10−11 m3⋅kg−1⋅s−2. The modern notation of Newton's law involving G was introduced in the 1890s by C. V. Boys. The first implicit measurement with an accuracy within about 1% is attributed to Henry Cavendish in a 1798 experiment. κ = 8π/c4G ≈ 6957207100000000000♠2.071×10−43 s2⋅m−1⋅kg−1. This corresponds to a relative standard uncertainty of 6995460000000000000♠4.6×10−5 (46 ppm). In cgs, G can be written as G ≈ 6992667400000000000♠6.674×10−8 cm3⋅g−1⋅s−2. In other words, in Planck units, G has the numerical value of 7000100000000000000♠1. a measure for the gravitational attraction between a pair of electrons, proportional to the square of the electron rest mass. This way of expressing G shows the relationship between the average density of a planet and the period of a satellite orbiting just above its surface. where distance is measured in terms of the semi-major axis of Earth's orbit (the astronomical unit, AU), time in years, and mass in the total mass of the orbiting system (M = M☉ + M⊕ + M☾). The above equation is exact only within the approximation of the Earth's orbit around the Sun as a two-body problem in Newtonian mechanics, the measured quantities contain corrections from the perturbations from other bodies in the solar system and from general relativity. Since 2012, the AU is defined as 7011149597870700000♠1.495978707×1011 m exactly, and the equation can no longer be taken as holding precisely. The quantity GM—the product of the gravitational constant and the mass of a given astronomical body such as the Sun or Earth—is known as the standard gravitational parameter and (also denoted μ). The standard gravitational parameter GM appears as above in Newton's law of universal gravitation, as well as in formulas for the deflection of light caused by gravitational lensing, in Kepler's laws of planetary motion, and in the formula for escape velocity. This quantity gives a convenient simplification of various gravity-related formulas. The product GM is known much more accurately than either factor is. Calculations in celestial mechanics can also be carried out using the units of solar masses, mean solar days and astronomical units rather than standard SI units. For this purpose, the Gaussian gravitational constant was historically in widespread use, k = 6998172020989500000♠0.01720209895, expressing the mean angular velocity of the Sun–Earth system measured in radians per day. The use of this constant, and the implied definition of the astronomical unit discussed above, has been deprecated by the IAU in 2012. Between 1640 and 1650, Grimaldi and Riccioli had discovered that the distance covered by objects in free fall was proportional to the square of the time taken, which led them to attempt a calculation of the gravitational constant by recording the oscillations of a pendulum. A measurement was attempted in 1738 by Pierre Bouguer and Charles Marie de La Condamine, in their "Peruvian expedition". Bouguer downplayed the significance of their results in 1740, suggesting that the experiment had at least proved that the Earth could not be a hollow shell, as some thinkers of the day, including Edmond Halley, had suggested. Based on this, Hutton's 1778 result is equivalent to G ≈ 6989800000000000000♠8×10−11 m3⋅kg–1⋅s−2. Diagram of torsion balance used in the Cavendish experiment performed by Henry Cavendish in 1798, to measure G, with the help of a pulley, large balls hung from a frame were rotated into position next to the small balls. The first direct measurement of gravitational attraction between two bodies in the laboratory was performed in 1798, seventy-one years after Newton's death, by Henry Cavendish. He determined a value for G implicitly, using a torsion balance invented by the geologist Rev. John Michell (1753). He used a horizontal torsion beam with lead balls whose inertia (in relation to the torsion constant) he could tell by timing the beam's oscillation. Their faint attraction to other balls placed alongside the beam was detectable by the deflection it caused. In spite of the experimental design being due to Michell, the experiment is now known as the Cavendish experiment for its first successful execution by Cavendish. Cavendish's stated aim was the "weighing of Earth", that is, determining the average density of Earth and the Earth's mass. His result, ρ⊕ = 7000544800000000000♠5.448(33) g·cm−3, corresponds to value of G = 6989674000000000000♠6.74(4)×10−11 m3⋅kg–1⋅s−2. It is surprisingly accurate, about 1% above the modern value (comparable to the claimed standard uncertainty of 0.6%). The accuracy of the measured value of G has increased only modestly since the original Cavendish experiment.G is quite difficult to measure because gravity is much weaker than other fundamental forces, and an experimental apparatus cannot be separated from the gravitational influence of other bodies. Furthermore, gravity has no established relation to other fundamental forces, so it does not appear possible to calculate it indirectly from other constants that can be measured more accurately, as is done in some other areas of physics. Measurements with pendulums were made by Francesco Carlini (1821, 7000438999999999999♠4.39 g/cm3), Edward Sabine (1827, 7000476999999999999♠4.77 g/cm3) Carlo Ignazio Giulio (1841, 7000495000000000000♠4.95 g/cm3) and George Biddell Airy (1854, 7000660000000000000♠6.6 g/cm3). Cavendish's experiment was first repeated by Ferdinand Reich (1838, 1842, 1853), who found a value of 7000558320000000000♠5.5832(149) g·cm−3, which is actually worse than Cavendish's result, differing from the modern value by 1.5%. Cornu and Baille (1873), found 7000555999999999999♠5.56 g·cm−3. Cavendish's experiment proved to result in more reliable measurements than pendulum experiments of the "Schiehallion" (deflection) type or "Peruvian" (period as a function of altitude) type. Pendulum experiments still continued to be performed, by Robert von Sterneck (1883, results between 5.0 and 7000630000000000000♠6.3 g/cm3) and Thomas Corwin Mendenhall (1880, 7000577000000000000♠5.77 g/cm3). Cavendish's result was first improved upon by John Henry Poynting (1891), who published a value of 7000669000000000000♠6.69(84) g·cm−3, differing from the modern value by 0.2%, but compatible with the modern value within the cited standard uncertainty of 0.55%. In addition to Poynting, measurements were made by C. V. Boys (1895) and Carl Braun (1897), with compatible results suggesting G = 6989666000000000000♠6.66(1)×10−11 m3⋅kg−1⋅s−2. The modern notation involving the constant G was introduced by Boys in 1894 and becomes standard by the end of the 1890s, with values usually cited in the cgs system. 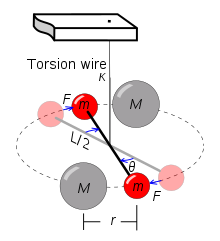 Richarz and Krigar-Menzel (1898) attempted a repetition of the Cavendish experiment using 100,000 kg of lead for the attracting mass. The precision of their result of 6989668300000000000♠6.683(11)×10−11 m3⋅kg−1⋅s−2 was, however, of the same order of magnitude as the other results at the time. Arthur Stanley Mackenzie in The Laws of Gravitation (1899) reviews the work done in the 19th century. Poynting is the author of the article "Gravitation" in the Encyclopædia Britannica Eleventh Edition (1911). Here, he cites a value of G = 6989666000000000000♠6.66×10−11 m3⋅kg−1⋅s−2 with an uncertainty of 0.2%. Paul R. Heyl (1930) published the value of 6989667000000000000♠6.670(5)×10−11 m3⋅kg–1⋅s−2 (relative uncertainty 0.1%), improved to 6989667300000000000♠6.673(3)×10−11 m3⋅kg–1⋅s−2 (relative uncertainty 0.045% = 450 ppm) in 1942. Published values of G derived from high-precision measurements since the 1950s have remained compatible with Heyl (1930), but within the relative uncertainty of about 0.1% (or 1,000 ppm) have varied rather broadly, and it is not entirely clear if the uncertainty has been reduced at all since the 1942 measurement. Some measurements published in the 1980s to 2000s were, in fact, mutually exclusive. Establishing a standard value for G with a standard uncertainty better than 0.1% has therefore remained rather speculative. By 1969, the value recommended by the National Institute of Standards and Technology (NIST) was cited with a standard uncertainty of 0.046% (460 ppm), lowered to 0.012% (120 ppm) by 1986. But the continued publication of conflicting measurements led NIST to radically increase the standard uncertainty in the 1998 recommended value, by a factor of 12, to a standard uncertainty of 0.15%, larger than the one given by Heyl (1930). The uncertainty was again lowered in 2002 and 2006, but once again raised, by a more conservative 20%, in 2010, matching the standard uncertainty of 120 ppm published in 1986. For the 2014 update, CODATA reduced the uncertainty to 46 ppm, less than half the 2010 value, and one order of magnitude below the 1969 recommendation. Timeline of measurements and recommended values for G since 1900: values recommended based on a literature review are shown in red, individual torsion balance experiments in blue, other types of experiments in green. In the January 2007 issue of Science, Fixler et al. described a measurement of the gravitational constant by a new technique, atom interferometry, reporting a value of G = 6989669300000000000♠6.693(34)×10−11 m3⋅kg−1⋅s−2, 0.28% (2800 ppm) higher than the 2006 CODATA value. An improved cold atom measurement by Rosi et al. was published in 2014 of G = 6989667191000000000♠6.67191(99)×10−11 m3⋅kg−1⋅s−2. Although much closer to the accepted value (suggesting that the Fixler et. al. measurement was erroneous), this result was 325 ppm below the recommended 2014 CODATA value, with non-overlapping standard uncertainty intervals. As of 2018, efforts to re-evaluate the conflicting results of measurements are underway, coordinated by NIST, notably a repetition of the experiments reported by Quinn et al. (2013). In August 2018, a Chinese research group announced new measurements based on torsion balances, 6989667418400000000♠6.674184(78)×10−11 m3⋅kg–1⋅s−2 and 6989667448400000000♠6.674484(78)×10−11 m3⋅kg–1⋅s−2 based on two different methods. These are claimed as the most accurate measurements ever made, with a standard uncertainties cited as low as 12 ppm. The difference of 2.7σ between the two results suggests there could be sources of error unaccounted for. A controversial 2015 study of some previous measurements of G, by Anderson et al., suggested that most of the mutually exclusive values in high-precision measurements of G can be explained by a periodic variation. The variation was measured as having a period of 5.9 years, similar to that observed in length-of-day (LOD) measurements, hinting at a common physical cause which is not necessarily a variation in G. A response was produced by some of the original authors of the G measurements used in Anderson et al. This response notes that Anderson et al. not only omitted measurements, they also used the time of publication not the time the experiments were performed. A plot with estimated time of measurement from contacting original authors seriously degrades the length of day correlation. Also taking the data collected over a decade by Karagioz and Izmailov shows no correlation with length of day measurements. As such the variations in G most likely arise from systematic measurement errors which have not properly been accounted for. Under the assumption that the physics of type Ia supernovae are universal, analysis of observations of 580 type Ia supernovae has shown that the gravitational constant has varied by less than one part in ten billion per year over the last nine billion years according to Mould et al. (2014). ^ "Newtonian constant of gravitation" is the name introduced for G by Boys (1894). Use of the term by T.E. Stern (1928) was misquoted as "Newton's constant of gravitation" in Pure Science Reviewed for Profound and Unsophisticated Students (1930), in what is apparently the first use of that term. Use of "Newton's constant" (without specifying "gravitation" or "gravity") is more recent, as "Newton's constant" was also used for the heat transfer coefficient in Newton's law of cooling, but has by now become quite common, e.g. Calmet et al, Quantum Black Holes (2013), p. 93; P. de Aquino, Beyond Standard Model Phenomenology at the LHC (2013), p. 3. The name "Cavendish gravitational constant", sometimes "Newton–Cavendish gravitational constant", appears to have been common in the 1970s to 1980s, especially in (translations from) Soviet-era Russian literature, e.g. Sagitov (1970 ), Soviet Physics: Uspekhi 30 (1987), Issues 1–6, p. 342 [etc.]. "Cavendish constant" and "Cavendish gravitational constant" is also used in Charles W. Misner, Kip S. Thorne, John Archibald Wheeler, "Gravitation", (1973), 1126f. Colloquial use of "Big G", as opposed to "little g" for gravitational acceleration dates to the 1960s (R.W. Fairbridge, The encyclopedia of atmospheric sciences and astrogeology, 1967, p. 436; note use of "Big G's" vs. "little g's" as early as the 1940s of the Einstein tensor Gμν vs. the metric tensor gμν, Scientific, medical, and technical books published in the United States of America: a selected list of titles in print with annotations: supplement of books published 1945–1948, Committee on American Scientific and Technical Bibliography National Research Council, 1950, p. 26). ^ Depending on the choice of definition of the stress–energy tensor it can also be normalized as κ = 8π/c2G ≈ 6974186600000000000♠1.866×10−26 m⋅kg−1. ^ For example, the gravitational force between an electron and proton one meter apart is approximately 6933099999999999999♠10−67 N, whereas the electromagnetic force between the same two particles is approximately 6972100000000000000♠10−28 N. The electromagnetic force in this example is some 39 orders of magnitude (i.e. 1039) greater than the force of gravity—roughly the same ratio as the mass of the Sun to a microgram. ^ Halliday, David; Resnick, Robert; Walker, Jearl (September 2007). Fundamentals of Physics (8th ed.). p. 336. ISBN 978-0-470-04618-0. ^ Grøn, Øyvind; Hervik, Sigbjorn (2007). Einstein's General Theory of Relativity: With Modern Applications in Cosmology (illustrated ed.). Springer Science & Business Media. p. 180. ISBN 978-0-387-69200-5. ^ Einstein, Albert (1916). "The Foundation of the General Theory of Relativity". Annalen der Physik. 354 (7): 769–822. Bibcode:1916AnP...354..769E. doi:10.1002/andp.19163540702. Archived from the original (PDF) on 2012-02-06. ^ Adler, Ronald; Bazin, Maurice; Schiffer, Menahem (1975). Introduction to General Relativity (2nd ed.). New York: McGraw-Hill. p. 345. ISBN 978-0-07-000423-8. ^ a b Gillies, George T. (1997). "The Newtonian gravitational constant: recent measurements and related studies". Reports on Progress in Physics. 60 (2): 151–225. Bibcode:1997RPPh...60..151G. doi:10.1088/0034-4885/60/2/001. . A lengthy, detailed review. See Figure 1 and Table 2 in particular. ^ Mohr, Peter J.; Newell, David B.; Taylor, Barry N. (2015-07-21). "CODATA Recommended Values of the Fundamental Physical Constants: 2014". Reviews of Modern Physics. 88 (3): 035009. arXiv:1507.07956. Bibcode:2016RvMP...88c5009M. doi:10.1103/RevModPhys.88.035009. ^ "Newtonian constant of gravitation G". CODATA, NIST. ^ M ≈ 1.000003040433 M☉, so that M = M☉ can be used for accuracies of five or fewer significant digits. ^ "Astrodynamic Constants". NASA/JPL. 27 February 2009. Retrieved 27 July 2009. Ries JC, Eanes RJ, Shum CK, Watkins MM (20 March 1992). "Progress in the determination of the gravitational coefficient of the Earth". Geophysical Research Letters. 19 (6): 529–531. Bibcode:1992GeoRL..19..529R. doi:10.1029/92GL00259. ^ J.L. Heilbron, Electricity in the 17th and 18th Centuries: A Study of Early Modern Physics (Berkeley: University of California Press, 1979), 180. ^ Davies, R.D. (1985). "A Commemoration of Maskelyne at Schiehallion". Quarterly Journal of the Royal Astronomical Society. 26 (3): 289–294. Bibcode:1985QJRAS..26..289D. ^ Poynting, J.H. (1913). The Earth: its shape, size, weight and spin. Cambridge. pp. 50–56. ^ Hutton, C. (1778). "An Account of the Calculations Made from the Survey and Measures Taken at Schehallien". Philosophical Transactions of the Royal Society. 68: 689–788. doi:10.1098/rstl.1778.0034. ^ Published in Philosophical Transactions of the Royal Society (1798); reprint: Cavendish, Henry (1798). "Experiments to Determine the Density of the Earth". In MacKenzie, A. S., Scientific Memoirs Vol. 9: The Laws of Gravitation. American Book Co. (1900), pp. 59–105. ^ 2014 CODATA value 6989667400000000000♠6.674×10−11 m3⋅kg−1⋅s−2. ^ Brush, Stephen G.; Holton, Gerald James (2001). Physics, the human adventure: from Copernicus to Einstein and beyond. New Brunswick, NJ: Rutgers University Press. p. 137. ISBN 978-0-8135-2908-0. Lee, Jennifer Lauren (November 16, 2016). "Big G Redux: Solving the Mystery of a Perplexing Result". NIST. ^ Poynting, John Henry (1894). The Mean Density of the Earth. London: Charles Griffin. pp. 22–24. ^ F. Reich, On the Repetition of the Cavendish Experiments for Determining the mean density of the Earth" Philosophical Magazine 12: 283-284. ^ Mackenzie (1899), p. 125. ^ A.S. Mackenzie , The Laws of Gravitation (1899), 127f. ^ Poynting, John Henry (1894). The mean density of the earth. Gerstein - University of Toronto. London. ^ C.V. Boys, Phil. Trans. Roy. Soc. A. Pt. 1. (1895). ^ Carl Braun, Denkschriften der k. Akad. d. Wiss. (Wien), math. u. naturwiss. Classe, 64 (1897). Braun (1897) quoted an optimistic standard uncertainty of 0.03%, 6989664900000000000♠6.649(2)×10−11 m3⋅kg−1⋅s−2 but his result was significantly worse than the 0.2% feasible at the time. ^ Sagitov, M. U., "Current Status of Determinations of the Gravitational Constant and the Mass of the Earth", Soviet Astronomy, Vol. 13 (1970), 712-718, translated from Astronomicheskii Zhurnal Vol. 46, No. 4 (July–August 1969), 907-915 (table of historical experiments p. 715). ^ Mackenzie, A. Stanley, The laws of gravitation; memoirs by Newton, Bouguer and Cavendish, together with abstracts of other important memoirs, American Book Company (1900 ). ^ Heyl, P. R. (1930). "A redetermination of the constant of gravitation" (PDF). National Bureau of Standards Journal of Research. 5 (6): 1243–1290. doi:10.6028/jres.005.074. ^ P. R. Heyl and P. Chrzanowski (1942), cited after Sagitov (1969:715). ^ Mohr, Peter J.; Taylor, Barry N. (January 2005). "CODATA recommended values of the fundamental physical constants: 2002" (PDF). Reviews of Modern Physics. 77 (1): 1–107. Bibcode:2005RvMP...77....1M. CiteSeerX 10.1.1.245.4554. doi:10.1103/RevModPhys.77.1. Archived from the original (PDF) on 2007-03-06. Retrieved 2006-07-01. Section Q (pp. 42–47) describes the mutually inconsistent measurement experiments from which the CODATA value for G was derived. ^ Mohr, Peter J.; Taylor, Barry N.; Newell, David B. (13 November 2012). "CODATA recommended values of the fundamental physical constants: 2010" (PDF). Reviews of Modern Physics. 84 (4): 1527–1605. arXiv:1203.5425. Bibcode:2012RvMP...84.1527M. CiteSeerX 10.1.1.150.3858. doi:10.1103/RevModPhys.84.1527. ^ Fixler, J. B.; Foster, G. T.; McGuirk, J. M.; Kasevich, M. A. (2007-01-05). "Atom Interferometer Measurement of the Newtonian Constant of Gravity". Science. 315 (5808): 74–77. Bibcode:2007Sci...315...74F. doi:10.1126/science.1135459. PMID 17204644. ^ Rosi, G.; Sorrentino, F.; Cacciapuoti, L.; Prevedelli, M.; Tino, G. M. (26 June 2014). "Precision measurement of the Newtonian gravitational constant using cold atoms" (PDF). Nature. 510 (7506): 518–521. arXiv:1412.7954. doi:10.1038/nature13433. PMID 24965653. Schlamminger, Stephan (18 June 2014). "Fundamental constants: A cool way to measure big G". Nature. 510 (7506): 478–480. Bibcode:2014Natur.510..478S. doi:10.1038/nature13507. PMID 24965646. T. Quinn; H. Parks; C. Speake; R. Davis (2013). "Improved determination of G using two methods". Phys. Rev. Lett. 111. 101102. The 2018 experiment was described by C. Rothleitner. Newton’s Gravitational Constant 'Big' G – A proposed Free-fall Measurement (PDF). CODATA Fundamental Constants Meeting, Eltville – 5 February 2015. ^ Li, Qing; et al. (2018). "Measurements of the gravitational constant using two independent methods". Nature. 560 (7720): 582–588. doi:10.1038/s41586-018-0431-5. PMID 30158607. . See also: "Physicists just made the most precise measurement ever of Gravity's strength". August 31, 2018. Retrieved October 13, 2018. ^ Anderson, J. D.; Schubert, G.; Trimble, 3=V. ; Feldman, M. R. (April 2015). "Measurements of Newton's gravitational constant and the length of day" (PDF). EPL. 110 (1): 10002. arXiv:1504.06604. Bibcode:2015EL....11010002A. doi:10.1209/0295-5075/110/10002. ^ a b Schlamminger, S.; Gundlach, J. H.; Newman, R. D. (2015). "Recent measurements of the gravitational constant as a function of time". Physical Review D. 91 (12): 121101. arXiv:1505.01774. Bibcode:2015PhRvD..91l1101S. doi:10.1103/PhysRevD.91.121101. ISSN 1550-7998. ^ Karagioz, O. V.; Izmailov, V. P. (1996). "Measurement of the gravitational constant with a torsion balance". Measurement Techniques. 39 (10): 979–987. doi:10.1007/BF02377461. ISSN 0543-1972. ^ Mould, J.; Uddin, S. A. (2014-04-10). "Constraining a Possible Variation of G with Type Ia Supernovae". Publications of the Astronomical Society of Australia. 31: e015. arXiv:1402.1534. Bibcode:2014PASA...31...15M. doi:10.1017/pasa.2014.9. Gundlach, Jens H.; Merkowitz, Stephen M. (2000). "Measurement of Newton's Constant Using a Torsion Balance with Angular Acceleration Feedback". Physical Review Letters. 85 (14): 2869–2872. arXiv:gr-qc/0006043. Bibcode:2000PhRvL..85.2869G. doi:10.1103/PhysRevLett.85.2869. PMID 11005956.